Against current playoff teams, the Penguins are 12-10-5. Of their 29 total wins, the Penguins only have 8 wins in regulation against current playoff teams. The above records are troubling and should give Penguins fans pause before celebrating the fact that the Penguins are, for now, in first place. If I were to pick one of the four teams from the Metro to miss the playoffs, as of today, it would be the Penguins, based on their lackluster performance against good competition and downright awful play within the division. I don't think this is going to happen, its more of an indictment of how poorly the Penguins have played over the past month or so. A lot can happen in the next 31 games but it's pretty clear that the Metro is going to go down to the wire. Nothing like games against New Jersey and Edmonton to cure what ails you. But did they? Sure, the Penguins are (temporarily) back on top of the division, but have they looked like a first place team over the past couple of weeks? If it wasn't for the rest of the Metro having an off week, the Pens might not find themselves where they do in the standings. Furthermore, the Rangers have closed the gap to only 2 points with 2 games in hand. Only Blake Comeau and Christian Ehrhoff are missing from the lineup (of the players that they expect to get back this season) so the Pens are getting healthier (relatively) - and they'll need to in order to maintain pace with the rest of the division. Well, looks like the Okposo injury has had more of an effect on this team than was previously thought as the Isles were winless last week. Moving on without Okposo isn't going to get any easier - especially with the way that the division has tightened up - but its not like the Islanders really have a choice. Games against the Sabres and the Oilers should help. The Rangers are probably the most complete team in the East - ranking in the top 5 in goals scored per game as well as goals against per game in the NHL. Rick "Blimpie" Nash leads the NHL in goals and is an MVP candidate. King Henrik, however, is going to miss some time with a neck injury - but how much is unknown at this time. Depending on how long he is out, it could slow the rise of the Rangers to the top of the division. The Caps really hadn't been playing all that great of hockey until they blanked the defending Stanley Cup champion L.A. Kings 4-0 in their last game. Shockingly enough (Brooks Orpik contract), the Caps have had some defensive breakdowns as of late leading to giving up 40 shots in a game against the Blues. Alexander Ovechkin was named the NHL number 1 star for the month of January proving that shooting from the same spot all of the time can be rewarding. The Flyers have won 4 in a row and have made things a little more interesting in the Eastern Conference standings. They are within 3 points of ninth place Florida, but still trail Boston by 10 points. It's still probably too much ground to make up, but nobody wants to play this team right now. #JagrWatch has lost a lot of its steam, but it will probably pick up again as the deadline approaches. The Devils have been playing (albeit boring) hockey and are moving up the standings as a result. Not that it matters, or that anyone really cares, but good for them. Life without Bob has proven to be difficult for the Blue Jackets as they have failed miserably at their first test post All Star Game. After going 0-3 last week, the Blue Jackets are back in the McDavid sweepstakes and are in danger of falling below Carolina in the standings. The only good news is that at least they aren't Buffalo. The Hurricanes continue to play good hockey and probably won't finish at the bottom of the division once all is said and done. Now its just a question of if they can keep it up and carry the momentum into next season. 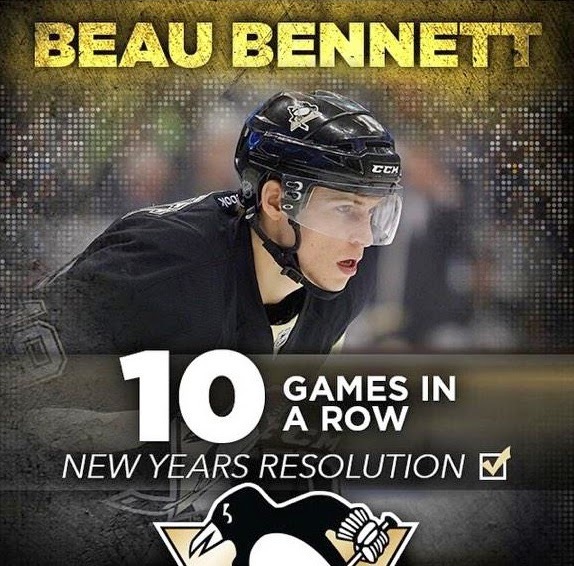 Yes the above graphic is a little tongue and cheek given Beau Bennett's well documented struggles with injuries. Bennett's streak, however stopped at 12 games - not because of another injury, but because he was benched due to poor performance. The Penguins may not realize that Bennett is healthy since he hasn't played in two of the past three games, but he is. If he is riding the pine instead of stalwarts such as Craig Adams and Zach Sill, then there has to be more to this story. The Penguins have been waiting for Bennett to develop into a top six forward since he was drafted 20th overall in the 2010 draft, but that was under another regime. Apparently he is in Mike Johnston's doghouse and not being a Johnston or Jim Rutherford guy doesn't bode well for Sunshine's future in Pittsburgh. Maybe they are just trying to save him from the inevitable future injury so they will have him to add some depth for the stretch run, but I doubt it. With the trade deadline approaching, how Bennett is treated during the next week or so will provide a lot of clues as to what the Penguins are thinking regarding the status of their embattled winger. What do you think the Penguins should do about Bennett? Beau is a great player. I believe he is just playing a little careful because of all the injuries he has had. He plays AMAZING with Sutter! Do not trade Beau and place him back with a Sutter- they have great chemistry!